November, of course, has a particular significance for the community of St Martins. It was on the 23rd November 1968 that Ifton Colliery closed and changed the face of the village forever. Ten years later, in 1978, the pit had effectively disappeared and a spoil heap had been both re-graded and covered with top soil. A green space available to the public had been created. This became known as Ifton Meadows and is now a Local Nature Reserve. It is managed locally by a small group who call themselves The Friends of Ifton Meadows and is regarded as an asset to the parish. So it was that in 2008 the community organised activities designed to both celebrate and remember this 40th anniversary of the closure of the Ifton Colliery. The following are some highlights of that week. Wednesday 19th November saw the launch of the new disabled access leaflet with Ifton Meadows featured on the front cover. The author acknowledged the improvement in access which now enables a wheelchair user to gain access all the way up to the viewpoint, and from there, to enjoy the view across the border to the Welsh mountains and hills. The main Meadows Path is now officially Category 3. The new publication is available to download at http://www.disabledholidayinfo.org.uk/publications.htm and is of course available at St Martins Community Centre. Friday saw the annual Lamplight Procession at the meadows. This of course is a reflection of the miners walking to the mine in years gone by. 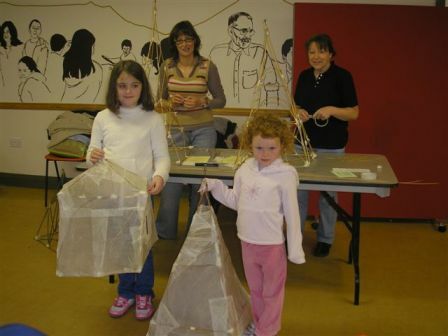 Lantern making workshops run by Mary Lewery had been particularly successful and there were a great variety and number of lanterns made, at Ifton Heath School, at the Community Centre, and in the Scout Hut. Everyone’s efforts resulted in some 100 lanterns being carried by young and old alike. People braved the bitterly cold wind to enjoy an evening which is now well established in local tradition. There was no moon and it was a black night until the lanterns were lit. 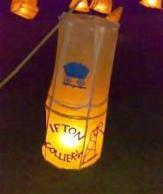 The procession of lanterns started at the Main Colliery entrance to the Meadows and was led by the Rhyn Park Drum Band. The story of coal mining in the area was related by Ruth Moore Williams. As the story unfolded we were treated to fire-illuminated shadow panels depicting the changes in mining over the years. And finally, as technology moved, on Steam power! There was the winding gear, the steam train and the mine chimney. All the panels had been carefully crafted and the winding wheel actually rotated! Following on from the story the Lanterns were carried up the main path, which was lit with fire cans, until they reached the first summit were a fire-eater and juggler entertained us before the main firework display. A barbecue followed at the Community Centre with the juggler again entertaining the children and adults alike. It was truly a great evening. Later, on Saturday Evening we enjoyed a concert at The Miner’s Institute. Nearly 200 people were in the hall to be entertained by the Rhos Orpheus Male Choir together with Ruth Moore-Williams the well known singer and storyteller. The choir opened with Men of Harlech which gave us a taste of things to come. It was a brilliant programme, including something for every taste. The soloists were impressive and Alf Gladman’s rendition of “ A Nightingale sang in Berkely Square” was absolutely wonderful. Ruth had the audience enthralled with her anecdotes and reminiscences, all gleaned from local people over the summer. She also told the tale of the discovery of coal, way back in the Stone Age. The idea that Alf, the stone age man from Gobowen, first found coal when he was on his way to Stan’s was absolutely fine!..... But to ask us to believe that his wife Gladys accidentally discovered its heat properties by throwing it away on the fire did seem a little far fetched. Ann Williams, as chair of the Friends of Ifton Meadows , closed the evening with the raffle results and thanks. Little did she know that they would still be singing in the bar close to midnight! Sunday evening, 23rd November, the actual anniversary of the closure of the mine, was the highlight of the week with the procession of Lamps to the St Martins Parish Church for a Service of Remembrance. The afternoon‘s weather was horrendous with rain, hail, thunder and lightening and there were a few who doubted that we would be able to march. In the event, at the stroke of 6-o-clock, and as planned, the procession started into a dry evening with starry skies. The procession was led by Parish Council Chairman Neil Graham accompanied by a young lady who appeared far too young to carry her own lantern, and obviously needed Neil to do the hard work. The following group was led by Ifton Brass Band wearing mining helmets complete with lamps. They were followed by the various group representatives and then individual children and families followed on behind. It was quite a sight as they marched down Green Lane to the church and many people turned out to watch the progress. The Churchyard itself was lit, thanks to the efforts of volunteers who had braved the afternoon’s weather. Glass lights marked the way forward, lit lanterns were hanging from the trees; and every effort was made to mark all the graves of the miners with a lighted candle. An illuminated cross was set to acknowledge that of course, not all miners’ graves are known or marked. The procession proceeded into church and was joined by villagers and visitors from neighbouring villages. The church was packed, with standing room only for those at the back. The church had been decorated for the occasion, with mining artefacts laid out on window ledges and tables. Candles were lit and the church looked a wonderful sight. Colours were presented during the first hymn “Abide with Me” and our newly made Ifton Meadows Banner, which had been only recently presented by the Craft Group, certainly looked the part. There was a mining theme throughout the service with ex-miners both speaking and being spoken of. Ruth Moore Williams again told the story of some of the history of the Ifton Mine and its miners, repeating a selection of anecdotes from local people and singing a song which she wrote especially for the occasion. The service continued with Ifton Brass Band accompanying the hymns and with the Rev Stuart Jermy reflecting on and contrasting the importance of light in the pit, and light in our lives. The service included a bible reading by Mayor Betty Gull and as an act of Remembrance, 40 candles were lit by members of the congregation. It was an evening of celebration, of reflection and of remembrance. After the service we were invited into the Chapter House where the ladies hosted refreshments which, as always, were very well received. An excellent and enjoyable weekend was indeed well concluded. The Friends of Ifton meadows led the main initiative and provided the backbone to the weekend. Sue Heard grew an initially simple proposal into an impressive Memorial Mosaic at the summit of the Meadows. The Rhos Orpheus Male Choir and our own Ifton Band were both key players. Ruth Moore-Williams, Mary Lewery and Cadi Price all played their part. The Rev. Stuart Jermy organised a fitting Memorial Service and what’s more delivered on his promise of dry weather at the most critical points! We had help from many volunteers and local groups and it was a true community effort. The Friends of Ifton Meadows thank everyone who contributed to a truly memorable weekend.